For other uses, see To Catch a Thief (disambiguation). The pattern of a string of jewel robberies on the French Riviera causes the police to believe that the infamous jewel thief John "The Cat" Robie (Cary Grant) has left his comfortable retirement of growing grapes and flowers. He gives the police the slip at his hilltop villa. Robie visits a restaurant. The staff are his old gang, paroled for their work in the French Resistance during World War II as long as they keep clean. Bertani, Foussard, and the others angrily blame Robie because they are all under suspicion so long as the new Cat is active. When the police arrive at Bertani's restaurant looking for Robie, Foussard's teenage daughter Danielle (Brigitte Auber), who has a crush on him, spirits him to safety. Robie recognizes he can prove his innocence by catching the new Cat in the act. He enlists the aid of an insurance man, H. H. Hughson (John Williams), who reluctantly obtains a list of the most expensive jewelry owners currently on the Riviera. Tourists Jessie Stevens (Jessie Royce Landis), a wealthy nouveau riche widow, and her daughter Frances (Grace Kelly), top the list. Robie strikes up a friendship with them. Jessie is delighted but Frances offers a pretense of modesty. When Robie and Frances run into Danielle at the beach, Robie keeps up the mask of being a wealthy American tourist, despite Danielle's jealous barbs about his interest in Frances. Frances sees through Robie's cover. She seduces him, dangling before him her jewels. She teases him with steamy tales of rooftop escapades and offers herself as an accomplice who might share his crimes. Fireworks fill the night sky. The next morning, Jessie discovers her jewels are gone. Robie is accused by Frances of using her as a distraction so he could steal her mother's jewelry. The police are called, but Robie has disappeared. To catch the new Cat, Robie stakes out an estate at night. He struggles with an attacker, who loses his footing and tumbles over a cliff. It is Foussard, who dies in the fall. The police chief publicly announces that Foussard was the jewel thief, but, as Robie points out privately in the presence of the abashed Hughson, this would have been impossible because Foussard had a wooden leg, and could not climb on rooftops. Foussard's funeral is marred by Danielle's loud accusation that Robie is responsible for her father's death. Outside the graveyard, Frances apologizes to Robie and confesses her love. Robie needs to continue his search for the Cat. He asks Frances to arrange his attendance at a fancy masquerade ball, where he believes the Cat will strike again. At the ball, Frances is resplendent in a gold gown, Robie unrecognizable behind the mask of a Moor. The police hover nearby. Upstairs, the cat burglar silently cleans out several jewel boxes. When Jessie asks the Moor to go get her "heart pills," Robie's voice tips off his identity to the authorities. Upon his return, the police wait out Frances and the Moor as they dance together all night. When they go to her room, the mask is removed: it was Hughson, who switched to conceal Robie's exit. On the rooftop, Robie lurks. His patience is finally rewarded when he is joined by another figure in black. But just as his pursuit begins, the police throw a spotlight on him and demand he halt. He flees as they shoot at him, whereupon he manages to corner his foe with jewels in hand. Unmasked, his nemesis turns out to be Foussard's daughter, Danielle. She loses her footing on the roof, but Robie grabs her hand before she can fall. He forces her to confess the father-daughter involvement loudly to the police, and that Bertani was the ringleader of this gang. Robie speeds back to his villa. Frances follows to convince him that she has a place in his life. He agrees, but looks less than thrilled when she says, "Mother will love it up here." Alfred Hitchcock makes his signature cameo, approximately ten minutes into the film, as a bus passenger sitting next to Cary Grant. Despite Brigitte Auber's character being referred to as a "girl" or "teenager", compared to Grace Kelly's supposedly more mature character, Auber was actually 26 years old at the time of filming and more than a year and a half older than Kelly. To Catch a Thief was the director's first film (of five) made using the VistaVision widescreen process, and the last of the three Hitchcock films with Grace Kelly. The film was the penultimate collaboration with Cary Grant; only North by Northwest (1959) followed. It is also about a man with a mistaken identity who goes on a breakneck adventure to prove his innocence. The costumes were by Edith Head, including Kelly's memorable gold lamé gown for the film's costume ball. To Catch a Thief is the only Hitchcock film released by Paramount that is still owned and controlled by the company. The others were sold to Hitchcock in the early 1960s and are currently distributed by Universal Studios. The film drew mixed reviews from critics, with some enjoying Grant and Kelly in the lead roles as well as the French Riviera setting, while others expressed disappointment at the lack of suspense compared to earlier Hitchcock films. Bosley Crowther of The New York Times wrote in a positive review that the film "comes off completely as a hit in the old Hitchcock style ... Mr. Grant and Miss Kelly do grandly, especially in one sly seduction scene." Variety wrote that while the film was "not the suspense piece one usually associated with the Alfred Hitchcock name," it was "strong on sight and performance values" though it had "some plot weaknesses and is not as smooth in the unfolding as one might expect from an upper 'A' presentation." Harrison's Reports wrote, "Alfred Hitchcock has not endowed the action with as much suspense as one might expect in a picture produced and directed by him; nevertheless, its story of a one-time jewel robber who sets out to establish his innocence by catching a thief who was using his technique is tight and swiftly-paced, and constantly offers dramatic and comical developments." Richard L. Coe of The Washington Post called it "one of those de luxe pictures in which everyone lives in glorious workless luxury on the French Rivera, looks wonderful, speaks amusingly and is unconcerned with transit strikes or hurricanes. I loved every minute of it." Philip K. Scheuer of the Los Angeles Times was also positive, calling Grant and Kelly "ideal in the romantic leads" and the dialogue "daring but delightful," adding, "Above all, there is the spell of the French Riviera—a lazy, laissez-faire thing that apparently captivated the director as much as it will audiences in the soft, beguiling hues of its Technicolor and VistaVision." John McCarten of The New Yorker dismissed the film as "an Alfred Hitchcock picture that makes you wonder what has happened to the man ... As the heiress, Grace Kelly is very pretty. She does not, presumably, try to act." The Monthly Film Bulletin wrote, "Even a comedy thriller needs considerably more in the way of plain excitement and tension than To Catch a Thief provides, and Hitchcock's celebrated habit of playing tricks with the audience ... seem a poor substitute for the real thing." The Guardian called the film "a thorough disappointment," writing that Hitchcock had "failed so completely that one can only wonder if, in this tale of high-class burglary on the Côte d'Azur, he has not altogether abandoned his devotion to 'tension.' Certainly the 'whodunnit' element in this film is remarkably slack; the unmasking of the master criminal, which is the climax of the story, comes as mildly as bread and milk." The film presently holds a score of 95% on the review-aggregation website Rotten Tomatoes based on 44 reviews, with the critical consensus reading: "It may occasionally be guilty of coasting on pure charm, but To Catch a Thief has it in spades -- as well as a pair of perfectly matched stars in Cary Grant and Grace Kelly." Robert Burks won the Academy Award for Best Cinematography, while Hal Pereira, Joseph McMillan Johnson, Samuel M. Comer and Arthur Krams were nominated for Best Art Direction, and Edith Head was nominated for Best Costume Design. In 2002, American Film Institute included the film in AFI's 100 Years...100 Passions (#46). ^ "To Catch a Thief – Details". American Film Institute. Retrieved June 25, 2018. ^ "The Top Box-Office Hits of 1955". Variety Weekly. January 25, 1956. ^ a b c d Crowther, Bosley (August 5, 1955). 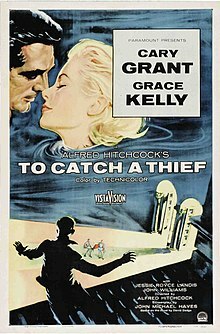 "To Catch a Thief (1955) Screen: Cat Man Out 'To Catch a Thief'; Grant is Ex-Burglar in Hitchcock Thriller". The New York Times. ^ Clarke, Stewart (May 23, 2018). "Hitchcock's 'To Catch a Thief' Set for Spanish-Language TV Series Remake". Variety. Retrieved May 27, 2018. ^ Crowther, Bosley (August 5, 1955). "Screen: Cat Man Out 'To Catch a Thief". The New York Times: 14. ^ "To Catch a Thief". Variety: 6. July 20, 1955. ^ "'To Catch a Thief' with Cary Grant and Grace Kelly". Harrison's Reports: 114. July 16, 1955. ^ Coe, Richard L. (August 19, 1955). "Catch a Smile and a Thief". The Washington Post: 30. ^ Scheuer, Philip K. (August 4, 1955). "Cary Grant, Grace Kelly, Riviera Charm in 'Thief'". Los Angeles Times: A7. ^ McCarten, John (August 13, 1955). "The Current Cinema". The New Yorker: 48–49. ^ "To Catch a Thief". The Monthly Film Bulletin. 22 (263): 179. December 1955. ^ "To Catch a Thief". Manchester Guardian: 5. November 1, 1955. ^ "To Catch a Thief". Rotten Tomatoes. Retrieved June 25, 2018. ^ "The 28th Academy Awards – 1956". Academy of Motion Picture Arts and Sciences. Retrieved August 23, 2016. ^ "AFI's 100 Years...100 Passions" (PDF). American Film Institute. 2002. Retrieved August 23, 2016. De Rosa, Steven (2001). Writing with Hitchcock: The Collaboration of Alfred Hitchcock and John Michael Hayes. Faber and Faber. ISBN 0571199909. Orengo, Nico (2006). La Guerra del Basilico (The Basil War (in Italian). Einaudi. ISBN 880618296X. Spoto, Donald (1999). The Dark Side of Genius. Da Capo. ISBN 0-306-80932-X. Vest, James M. (2003). Hitchcock and France: The Forging of an Auteur. Praeger. ISBN 0275970892. "Two Interviews About To Catch a Thief" by Tifenn Brisset, Film International magazine Vol. 11, No. 6, 2013, pages 13–21. Interviews with French script supervisor Sylvette Baudrot conducted September 2011 and actress Brigitte Auber, September 2011, March 2013, regarding their work on the film and with Cary Grant and Alfred Hitchcock. Discussion of a different ending and script differences. Twelve color photographs, nine pages. Wikimedia Commons has media related to To Catch a Thief (film).